What is a 5S Score? | Ready to transform your business? What is a 5S Score? For non-process projects, where metrics are not readily available, the 5S Score is a quick way to evaluate the success of your work area transformation. We use a consistent scoring system, which evaluates each component of 5S. In addition to an overall 5S score, each component can be tracked separately – to better identify remaining areas for improvement and support sustainment over the long term. We remove anything unnecessary – items that have just become part of the workspace for reasons long-forgotten and likely irrelevant today. This could be actual objects fields on a form, or even processes. We put the remaining items in the optimum order, taking into account the space available and frequency of use of each item. We actually physically clean the space and objects. Beyond that, we evaluate what causes the items to get dirty. Is it how they are placed in the space? Is there something physically wrong with the space that needs to be fixed before we place the objects back in it? We apply standardization to the extent that is makes sense in each situation. 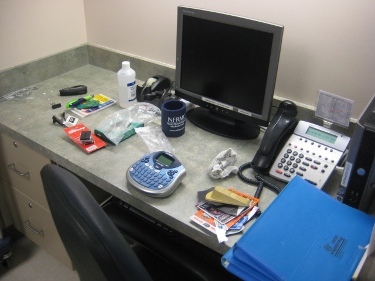 For example, at every Pharmacist workstation we ensure every object in the space is the same and in the same location. We train staff to follow the same methods during fulfillment. We evaluate the changes over time to make sure they are reasonable and sustainable. We see what aspects of the changes are more challenging and perhaps need re-evaluation. We provide ongoing training and support.